Last week Russia-backed militants kept violating the ceasefire using Minsk-proscribed weapons. 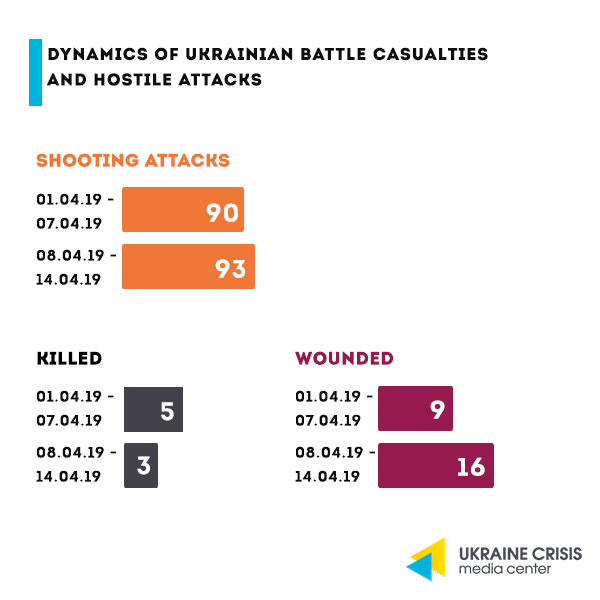 Russian proxies were firing upon the Ukrainian troops from antitank missile systems, grenade launchers, heavy machine guns and small arms. Ukraine’s Joint Forces maintain control of the adversary at the contact line while adhering to the ceasefire. The President of France Emmanuel Macron and the President of Ukraine Petro Poroshenko held negotiations at the Élysée Palace in Paris. 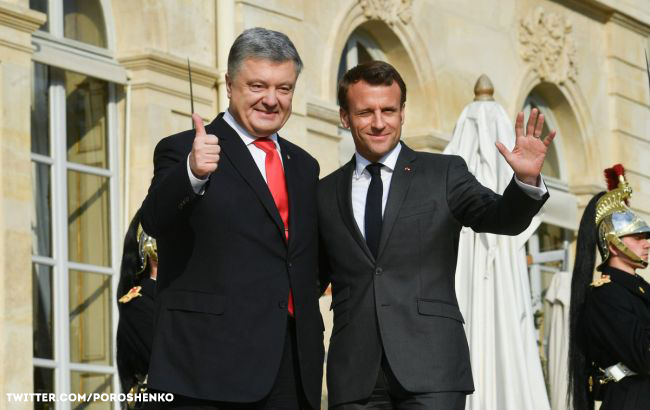 According to President Poroshenko at the meeting with the President Macron they discussed the liberation of Ukrainian political prisoners held in Russia and in the occupied part of Donetsk and Luhansk regions. He also announced a new initiative for liberation of the Ukrainian journalist Roman Sushchenko jailed in the Russian Federation. Poroshenko also said that the leaders of Germany and France agreed to hold a Normandy format meeting after the presidential elections in Ukraine. The Chancellor of Germany Angela Merkel is of the opinion that the Normandy format negotiations as to the settlement of the situation in Donbas proved to be effective and need to be continued. Macron meets Zelenskyi. The President of France Macron also met the candidate for President of Ukraine Volodymyr Zelenskyi. 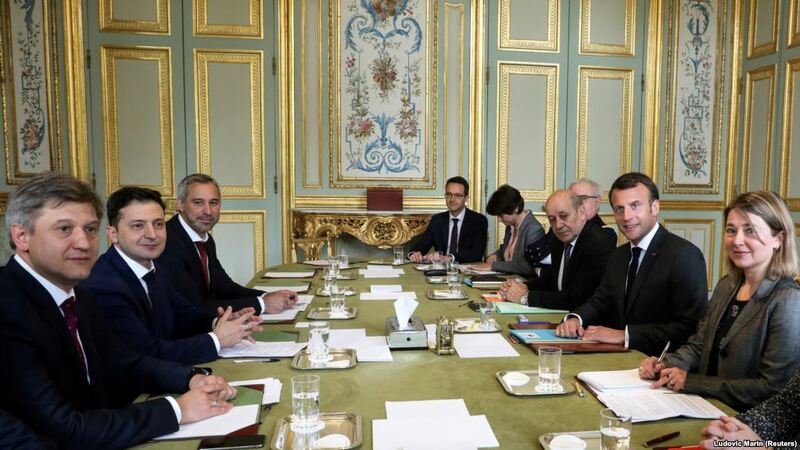 According to Zelenskyi, the meeting with the French President in Paris was held in a “very cool and welcoming environment. The meeting was very constructive, I did see a leader of the united Europe in front of me. We discussed the most important issues for the Ukrainian society and for Ukraine in general. We were talking about life, about what’s most important we talked, about ending the war in Donbas,” Zelenskyi stated. On Sunday, April 14, Petro Poroshenko came to the Olympiyskyi National Sport Complex. His opponent showman Volodymyr Zelenskyi earlier refused to be there on April 14 and said he will be waiting for Poroshenko at the stadium on April 19, on the day of the official debates that are to be held in the studio of the public broadcaster Suspilne. While Poroshenko was waiting for his opponent journalists could ask questions, about 200 journalists were present. What did Ukrainians hear from the President? Changes in staffing. President Poroshenko said that he dismissed the deputy head of the Foreign Intelligence Service Serhiy Semochko. Semochko became the protagonist of a scandal – a journalistic investigation revealed his alleged involvement in illicit enrichment as well as discovered he is a Russian passport holder alongside his family members. Semochko was said to be dismissed on April 12 but as of April 14 no order was published on the presidential web site. President Poroshenko also said he does not intend dismissing the Defense Minister Stepan Poltorak or the Foreign Affairs Minister Pavlo Klimkin after the presidential elections. Viktor Medvedchuk. Poroshenko said he is currently not holding meetings with Viktor Medvedchuk. “I have already said 10 times and I can repeat it again: de-facto Viktor Medvedchuk is Putin’s representative not a representative of Ukraine. He does not represent the President of Ukraine and will not do so,” Poroshenko said. Viktor Medvedchuk stated that he is negotiating and will keep negotiating the liberation of Ukrainian sailors held prisoners by the Russian Federation. Poroshenko stated that if re-elected President he will suggest amending the Constitution to introduce prefects instead of heads of the regional state administrations. Billboards with Putin. 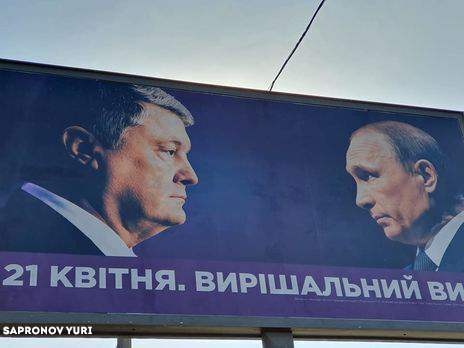 After the first round of elections billboards of Poroshenko facing Putin appeared across Ukraine. Many took them for a hint on the pro-Russian vector of Poroshenko’s opponent Zelenskyi. The President explained why his campaign billboards portrayed him facing Putin. 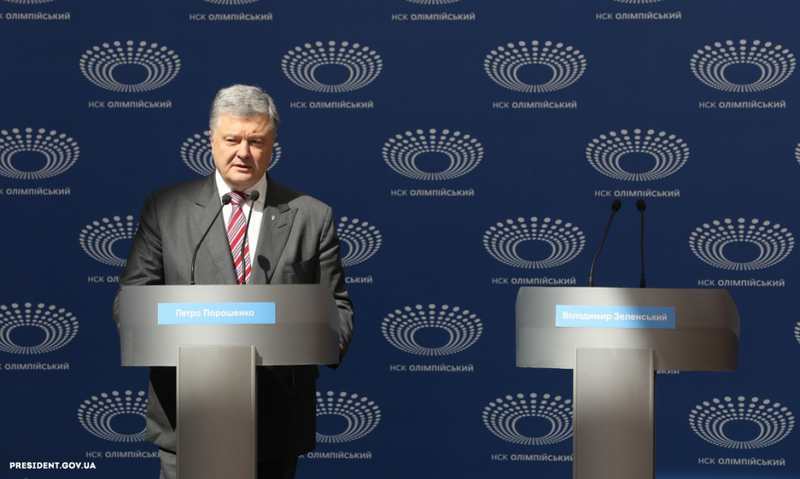 Responding to a journalist’s question he emphasized that it was not meant to compare his election opponent Volodymyr Zelenskyi with the Russian President. “I would like to emphasize that I have not and will not be putting the equals sign between Putin and Zelenskyi. Not in any way. It is not true. I would like to just remind Putin’s words that any other President of Ukraine but Poroshenko is his dream,” Poroshenko said. 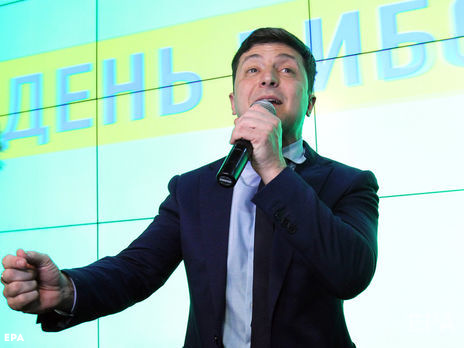 If Zelenskyi is elected: what’s next? Early Parliamentary elections scenario. In our recent piece we have already tackled the statement that in case Zelenskyi wins, the new President will be limited by the old Parliament, as the parliamentary elections will be held in autumn 2019. Until then the new President will likely have lost part of his popularity, while his political force (still forming) may not get a big number of seats in the Parliament. At the same time the early parliamentary elections scenario is not to rule out, the journalist of “Dzerkalo Tyzhnia” (Mirror of the Week) Serhiy Rakhmanin is convinced. He said possible dissolution of the Parliament is possible and the Kyiv district level administrative court can be featured in the scenario. The journalist emphasized that if respective documents are not provided, the court will be able to rule that the coalition has been invalid since February 28, 2019 and 30 days foreseen for a new coalition to form ended in late March. “Thus, the winner of the election race will have a court decision to base on to dissolve the Parliament immediately after he is sworn in,” the journalist explains. Interior Minister: possible interrogations of Poroshenko on corruption. Interior Minister Arsen Avakov admits that after his presidential term ends Petro Porshenko can be called for an interrogation on corruption cases mentioned by the media. “It is beyond my area of responsibility. I am a political minister. I guess, if there are grounds, we have enough agencies that can start cases against a citizen who once used to be the President. It is a normal procedure,” Avakov emphasized.